A lump of clay has the potential to do or be almost anything, but until the intent, creativity, and pressure of a higher being is applied, it just sits there. Generally it quite willingly gives to that pressure and molds to the shapes desired, but if left to its own devices, it will just sit on the table, inert, with no ideas or motivation or momentum of its own. With the steady and goal-oriented guidance of more intelligent hands, it can be shaped into a thing of beauty and purpose. A seed also appears to be an inert object, but is actually a small bundle of energy and potential that just needs a fertile environment in which to grow. 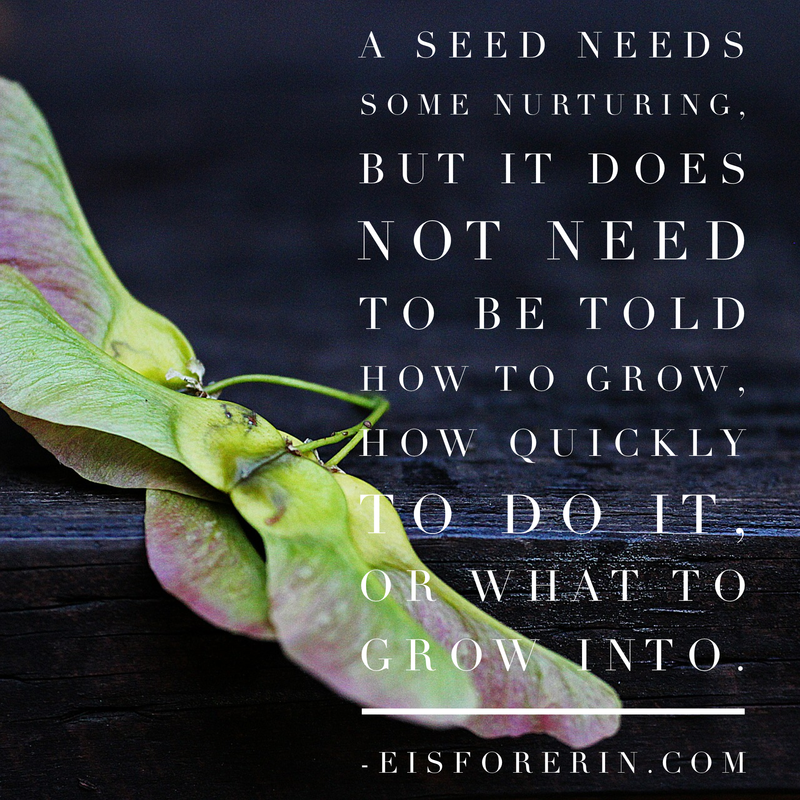 It needs some nurturing, but it does not need to be told how to grow, how quickly to do it, or what to grow into. Its full potential and eventual form are all contained within the seed. Funny thing, many seeds can even grow in a crack in the concrete; but it’s best to start with a nourishing soil, and sunlight and water as needed (another funny thing, too much watering can cause the budding plant to wilt). The seed needs opportunity, but not motivation; it is born with the drive become the mature form it will someday be. We can best help children learn, not by deciding what we think they should learn and thinking of ingenious ways to teach it to them, but by making the world, as far as we can, accessible to them, paying serious attention to what they do, answering their questions — if they have any — and helping them explore the things they are most interested in. I’ve heard many arguments against unschooling that go something like, “without adults to tell children how to behave, it will be Lord of the Flies.” Lord of the Flies is an allegory about the essential evil of human nature (by the way, NOT children’s nature specifically! It’s meant to be about people generally, much the way Animal Farm is not actually about the natural instincts of barnyard critters) that ties in with the concept of original sin (and the name “Lord of the Flies” is a synonym for Beelzebub). Golding believed that people were basically cruel and evil, and if the veneer of higher law and order were ever stripped away, we’d fall back on killing and eating each other. When people use the Lord of the Flies argument for controlling children, we should interpret that not as a parenting or teaching style but as a certain kind of fundamental worldview. I reject this worldview completely. I’m an atheist, but I’m a humanist with an essentially rational, not dogmatic, belief system. I believe that humans are social animals whose driving force is to form groups and support each other to perpetuate the species. My belief is almost the opposite of Golding’s, who felt that culture had the ability to sort of tenuously suppress evil; I think that culture often stirs up and perpetuates evil (see: racism, misogyny, ableism, classism, et al), while the essential nature of humans is sort of neutral-good. We are built to learn and thrive. It’s my view that children do not need to be taught how to think; they are born knowing this. What usually happens is that adults convince them they don’t know how to think, and that we must teach them. Some kids acquiesce to this more easily, and struggle with a lack of self-confidence as they believe the message that they quite incapable of thinking on their own; others resist it, and struggle with a lack of self-worth as they are continually locked in battle with adults who tell them they are defiant and disrespectful. These feelings don’t magically evaporate as we push grown children out of the nest; they persist into adulthood and so those children become adults who have fully internalized the belief that they were once children who, if they hadn’t been molded, sometimes forcibly, by adults, would not have amounted to anything – or worse, would default to delinquents and monsters. It stands to reason then that these are adults who, in turn, insist that children are lumps of clay who must be molded, taught how to think, shaped by outside hands into functional beings. As with many things in human culture, a cycle perpetuates itself. I think that being autistic gives me a kind of advantage when it comes to critically thinking about cultural practices. I am as susceptible as the next parent (and homeschooler) to the emotions of fear and feelings of inadequacy, but I don’t adopt cultural attitudes automatically. It’s not in my nature to do what everyone else is doing (in some ways doing so would actually help me, but it just isn’t my way). In parenting and in homeschooling I’ve taken a leap out of the cycle of molding Clay. Providing a nurturing environments for Seeds makes more sense to me, better suits my worldview, and is more conducive to the kind of mutually respectful relationship with my children (and any other children for which I am in the position of caring and teaching) that I desire. Image shows a sprig of maple seeds with the text: a seed needs some nurturing, but it does not need to be told how to grow, how quickly to do it, or what to grow into. – eisforerin.com.